A man wearing plate-armor who you can encounter at Dreg Heap. He wields the Splitleaf Greatsword. He states that he's an amnesiac hollow and calls himself "Lapp." He cannot remember his true name, or what he lived for. That's what brought him to his current location, where he is searching for the Purging Monument. Once the player has found the Purging Monument, they can go tell Lapp and he will thank the player. He also promises to remember the player as a friend, no matter what. After this, the player can find Lapp sitting at a grave site and promising the player will find treasure if they peep past the broken staircase. If the player does this, Lapp will then kick the player down onto the bottom of the staircase and remove his helmet, revealing himself to be Patches. Lapp makes his way around the Dreg Heap and Ringed City as you progress as well. Within the Earthen Peak Ruins, he can be summoned for the Demon Prince fight. He can also be summoned for the Halflight fight. Oh, look at you, you've got your head screwed on correct. Fantastic, to meet a kindred spirit, on this godforsaken crag. Well, that's the long and short of it, so if I completely forget who you are, don't be wrath with me c'mon what else can I say, I'm a bloody Hollow for heaven's sake! Great to still see you in one piece Cor, I can see why they call this the dreg heap at the worlds end Mangled remnants from every age and every land. It actually lends credence to the old rumours that the ringed city rests below it all. Ah, don't mind me, you needn't worry yourself with this nonsense. I just wanted to tell someone, and I'm sick of old humpty. I should stay quiet. wait, I'll make it up to you and let you in on a secret past here, you'll find the remains of a giant earthern tower, not a very nice place to visit, only there's precious treasure in the thick of the swamp. I didn't have any use for it you see, but I left the package behind. If I get the chance I could go fetch it for you, but maybe you'd rather go grab it yourself? I know who you are, a righteous warrior, yes, with a solemn duty to boot? Well, grab that treasure, that's as good a treasure as any. Ohh, look at you, you found the treasure dashing, just dashing, you'll make good use of it I'm sure. Now this is a little toast from me to you. - Siegbräu - Not much to speak of, but bottoms up - to the greatest warrior there is. Oh, there you are - perfect timing. Oh, well, fancy meeting you here. A true blessing, that we should seek the same place, and find ourselves standing here, together. I've got the last of my brew. Let's have our own little toast with it. To my search, and to your duty. And to the joy that lies before us. All right, then. Bottoms up! Now, I'm off in search of the Purging Monument. Once I find it, everything will come back to me. Who I was, what I lived for, what my name was. And… what terrible grudges I held. …I dunno, I just have this feeling. That that's the kind of man I was. Oh, don't hold it against me, I only think I was! Now, I'm off in search of the Purging Monument. Once I find it, everything will come back to me. Oh, and here we are again. How goes things? I'm rather running in circles, I'm afraid. I can't find the Purging Monument. And I've searched high and low. What if it was never here in the first place? Ah, bloody hell, what do I know. Sorry, I know it doesn't concern you. Seeing you all good and well, I… I just sort of spilled my guts to you. Just forget it all. Like a good Hollow would! …What did I come here in search of? Damn, stop it, I'm unbreakable, unbreakable. Are you certain of that? No, sorry, I know you'd never lie to me. Thank you, thank you kindly. I'll speed right on over. It won't be long now, before I know everything. Who I was, what I lived for, and what my name was. And I'll have you to thank for it all. Ahh, thank you, most sincerely. I swear upon my birth name. That I am your friend. No matter what might come out, no matter what I was. If you would do me the honour, allow me to be a true friend, always. It won't be long now, before I know everything. Who I was, what I lived for, and what my name was. And I'll have you to thank for it all. Now I know exactly who I was. And for that, I've a little thanks to be giving. Go this way, and peep past the broken staircase. Some awfully fine treasure's just sitting there all alone. It'll change your life. I've much to thank you for, so I'll say it again and again. Go this way, and peep past the broken staircase. Some awfully fine treasure's just sitting there all alone. What, don't you believe me? Every age, it seems, is tainted by the greed of men. Rubbish, to one such as I, devoid of all wordly wants. Heh heh heh heh heh heh. Hmmm, I dunno, maybe it's just the way we are. I'll stick you in my prayers. 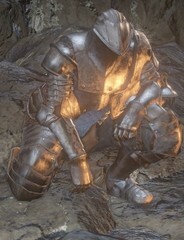 A fine dark soul, to you. Stop it! Oh, please! …Bloody hell! Lost your mind, have you? Then I have no choice! Forgive me! …Perhaps …I deserved this. Forgive me, friend. I cannot die just yet. What in bloody hell? Stop that! Enough of that! …Bloody hell, you've lost your head, have you? Then, let's have a go, shall we? I'm unbreakable! You can't crack me! I'll rot yer flesh! …Curses, of all the luck. Everything always goes to pot, doesn't it? True friends, eh? Everything always goes to pot, doesn't it? Steel armor of the amnesiac Lapp. 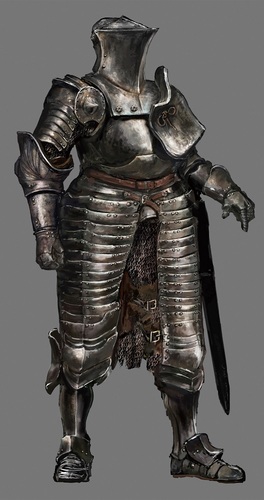 This plate-armor body, that covers the torso cleanly without even slight gaps, provides heavy defense. Quite fit to conceal a hollowed body, and indeed one's very identity.